about last week's houndstooth post. to share with us circa 1974! Share these memories with all of us! Tell us about your first! My first sofa? An apartment-sized white leather (yep, real leather) bought in the French Quarter. My first apartment was in the warehouse district of New Orleans in the late eighties. It would have looked equally at home on the set of Miami Vice. Alison, love the houndstooth sofa you show here. The one I had was boxy, much prefer the curves on this beauty! You had me digging through old photos to see if I could find a photo of it. I actually did! Oh, the memories! It was my first apartment without a room mate and totally furnished on my own. What fun it was add pieces as I could afford on my meager teacher salary. I still have the faux bamboo writing desk and bentwood arm chair that was my major purchase at the time. Email me the photo you found and I will post it here! First of all, I'll take the herringbone sofa in blue or red for the farmhouse. Please. My first sofa. My MIL picked it out for us as a wedding gift SURPRISE. What was then called 'early American' style in a country scenes print of oranges green and browns. Hideous. Just hideous. Kind of her...but..
Green velvet tufted sofa. It was very big and comfortable. We bought it when we bought our first house. I still like that style but would definitely not get velvet now. Fun memory post . . . I remember not much money, first year of teaching, husband in college and we needed a place for the family to sit and sleep for a first Thanksgiving visit. A bargain purchase, fake like leather, flipped over into a bed, wooden arms, matching chair and tables. Served us well for a few years! Awwww . . . the memories! Alison I think I have made myself forget about that first couch; however I do remember when I was able to order my first custom sofa with the fabric I wanted!! oops - I meant Haitian cotton. Just remembering how badly everything and anything stained it! Alison, I sent the photo, though not the best quality. This is such a fun post. Honestly I haven't thought about that sofa in many long years. It was my first big purchase for my first solo apartment as a single working girl. It was a sleeper sofa for guest because my tiny apartment only had 1 bedroom. Would love to have another houndstooth sofa in a different style. Love the one you show! Ha Sweet Pea, I have a English Mahogany Antique boot rack that I thought you might be interested in. It is for English riding high top boots like you got from me. You can see it on my blog. my old historic house what's new. I want to sell it. They have a lot of them on ebay, none as nice as mine. email me your email address and I will send a picture. 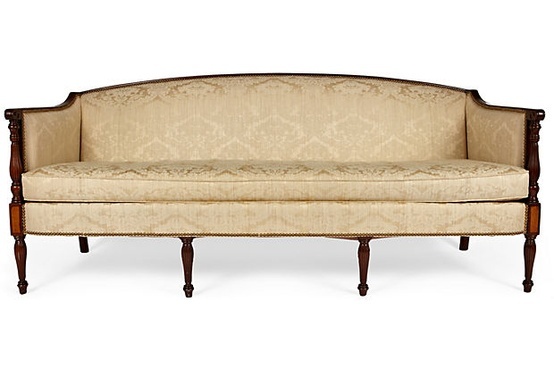 My first sofa was a traditional three cushion white rolled arm sofa and I loved it. I even had the matching loveseat! They barely fit in my little apartment and it took me a year to pay them off. I mixed them with pine wood, wicker and folk art. I loved that little apartment. Ha! My first sofa was a contemporary white silk, with mauve and light blue swirls...very 80's. I bought it for my first apartment because I loved Paige on Knots Landing. I thought her tv apartment was everything! At the very real risk of revealing my age, it was the early seventies and I saved to buy my first club style sofa in a chocolate brown and white strip. Chocolate brown was very big during that time. It served me well and came with me to my husband and my first apartment. It was covered in indestructible herculon. I don't even know what that fabric was but you couldn't damage it if you tried. Ha! 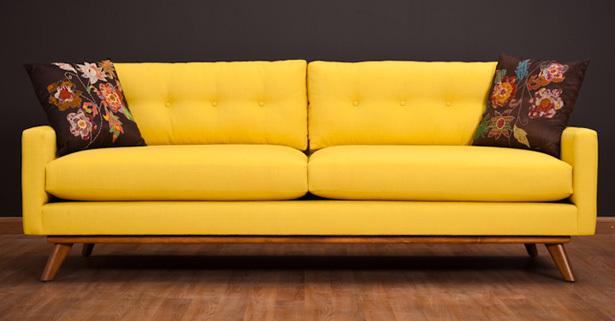 My first couch was purchased at Wickes Furniture store in Northbrook. I think they went out of business. I think it took me 3 years to pay it off. 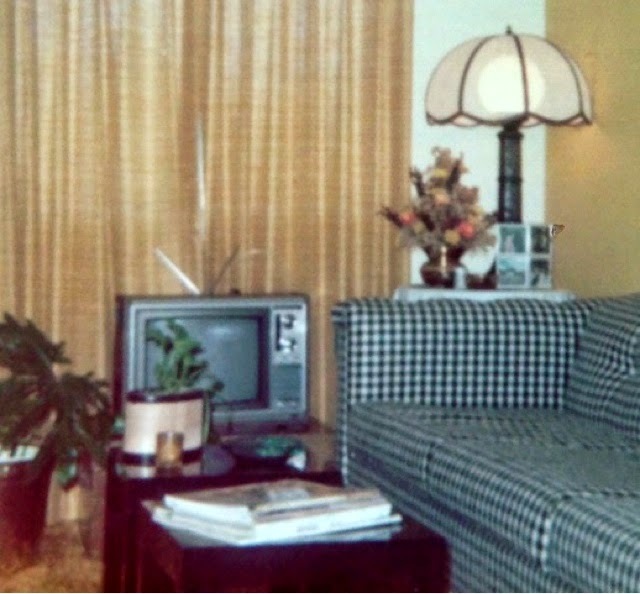 That was the apt I shared with Patty T.
My first sofa purchase was right alongside my husband and it is one that brings back fond memories because we were so young (me 18, he 20) and this was our first piece of furniture we ever purchased. His Mom and Dad gave us $500 as a wedding gift and we bought a sofa that had a deep mauve with slate blue flowers fabric! It was so stylin' at the time! lol Our entire apt. was mauve and slate blue. Thanks for this fun trip down memory lane!